Early bird registration for ALL teams begins mid-January and ends March 1st. Players who register before March 1st can apply a discount code to receive 10% off their registration fee. Minikicks/Rec Teams: Regular registration for begins March 2nd and ends June 8th. U10 and up (Travel Teams): Regular registration for begins March 2nd and ends May 15th for Travel teams. Registration is done online through our website under the "REGISTER" tab. You must create an account in order to register. We also will hold at least 2 registration nights where parents can come to ask questions or register and pay in person, you are not required to attend registration nights. Once registration begins you will be able to click the register button next to the listed league, answer the questions, and complete the process. You can register all your players at once and pay online. If you need to pay offline, please attend one of the registration nights or contact us. If you already have an account please sign-in and make sure your profile information is up to date. Your player's age is determined by subtracting their birth year from the current season year. For example, for the summer of 2017 if your player was born in 2010 they will be on a 7-8 year old recreational team (2017-2010). Minikicks are ages 3- 4 years old (must be potty trained). Recreational league are ages 5-8. The players are split into two divisions (5-6 year olds and 7-8 year olds), then into teams. They will scrimmage teams that are the same age. Travel leagues are 9 years and up. 9-10 year olds are U10 team(s), depending on numbers. 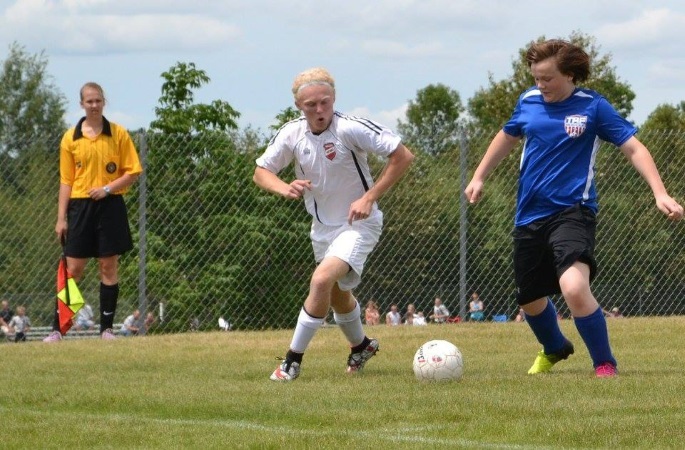 Our 11+ year olds are placed onto a team depending on numbers and ages of registered players. All travel leagues play competitively against other surrounding area teams. My player is a recreational/minikick player, what do they need? 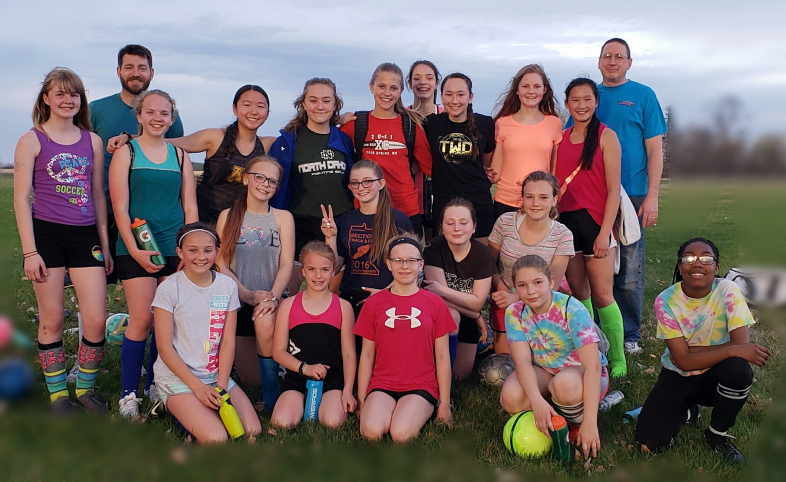 Players in minikicks and the recreational leagues will need a SIZE 3 BALL, shinguards, athletic shoes (soccer cleats not required but do add more grip), and a water bottle. They will be provided with a team shirt to wear for practices. My player is a travel player, what do they need? Players on the 9-12 year old teams will need a SIZE 4 BALL, A JERSEY, shinguards, soccer cleats, and a water bottle. Players on the 13 and above teams will need a SIZE 5 BALL, A JERSEY, shinguards, soccer cleats, and a water bottle. NOTE: Please note that travel players must purchase their own jersey. Jerseys are not be provided by the club for this age group. The jersey can be purchased during registration or online. See your coach for more details. We strongly encourage all parents to attend the Parents Night (April 15th) to meet and greet with the board and coaches regarding practice schedules. Currently, practice is scheduled to being the week of April 23rd-30th, weather pending, but individual practices and start days are ultimately set by the team coach. Minikicks: begin practice end of May or beginning of June. (Will be announced). Minikick players practice once a week on Wednesday at 6pm. There will be 6 practices with 1 makeup week if there is a rain out. Recreational teams: begin practice end of May or beginning of June (will be announced). Rec leagues play twice a week on Tuesday and Thursday at either 6pm or 7pm. Game nights will be on Thursday, and there will be 1 game at either 6pm or 7pm for each team. Travel teams: begin practice in April and are determined by each individual teams coach. 9 & 10 year old teams generally practice 2 times a week on Tuesday and Thursday evenings. Older teams practice 2-3 times per week. We do have a family cap of $250. Let us know when you have over the family max, and we will reduce your fees. Coaches and board member receive 1 free registration for the season, if you are interested in becoming a coach or board member, please contact a board member (see "Board" tab). How do I know who what team my player is on? Teams will be announced at the Parents Meeting April 15th at Franklin Middle School. We will also post team rosters to the TRFSA Facebook page and website. 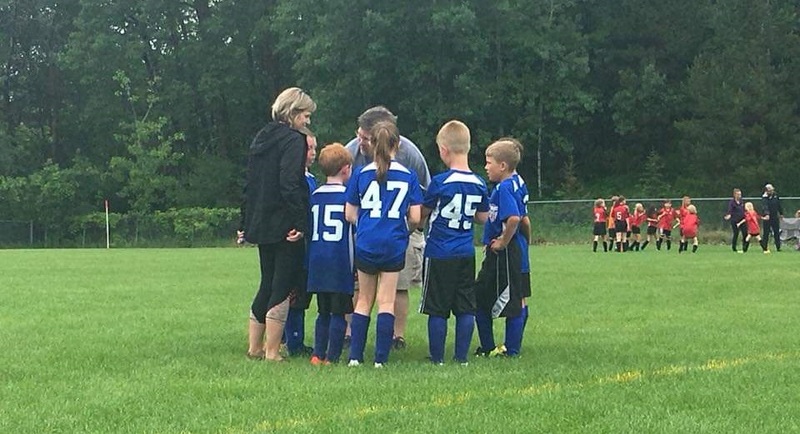 For Minikick and recreational teams, parents will be notified what team they are on at least 2 weeks prior to the start of practice. Once updated, your player's team can be found by logging into your account and viewing your family's current registrations on the main page. How do I know who the coach is? Team coaches will be announced at the Parents Meeting April 15th at Franklin Middle School. We will also post team coaches to the TRFSA Facebook page and website. Coaches will be listed with their teams as they are assigned. Travel coaches will contact parents via their soccer accounts/email/or phone to let parents know when their team meeting is. When will I get the schedule? Recreational schedules will be available online by the first practice. Coaches are responsible for handing out practice schedules. Travel schedules will be listed online as the schedules are finalized. Coaches are responsible for handing out practice schedules. What happens if practice or games are cancelled due to weather? Weather in our area inevitable impacts soccer in our area. Coaches are responsible for cancelling practice due to weather. In the event weather may impact practice and/or games, PLEASE CONTACT YOUR COACH. We will try to post weather-related updates to Facebook as soon as possible, but we often don't know if there's practice/games until the coaches have reached out to us. Soccer players should dress for the weather: some days we have beautiful weather to play in. Some days we have cold, rainy weather and others very hot and humid. Always dress appropriately for practice/games and have an adequate water supply with for both games and practices. There are no volunteer requirements for minikicks, but of course, parents are welcome to help out if they would like to. 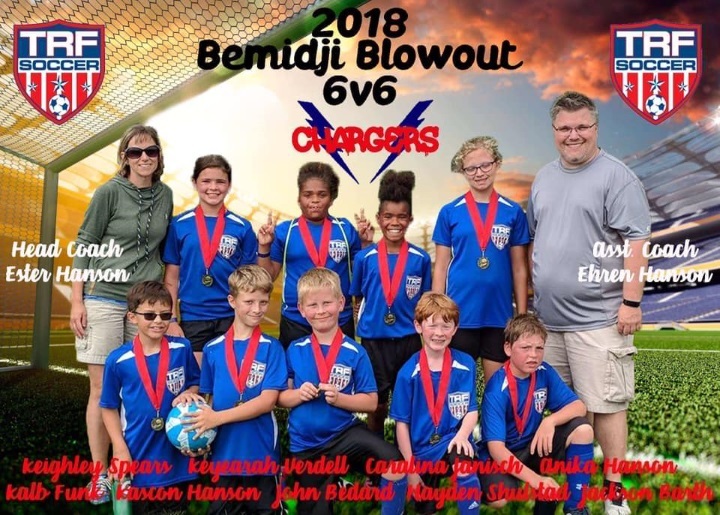 For the players 6-18 parents/players are required to volunteer for 2 hours or pay a non-volunteer fee, the hours and volunteer fees are per family (you have 2 children playing, you only have to volunteer 2 hours in total or pay the non-volunteer fee once). We rely on volunteers to keep our registration fees low. We use volunteers to help run concessions, to act as coaches, as board members, and for season prep. Volunteer position sign up will be available at the Parents Night and online after. I'm interested in coaching soccer. Who should I contact? We're always happy to have people interested in coaching (please see our "Coaches" tab on the main page). If you are interested in becoming a coach, please email the TRFSA president at trfsoccerpresident@gmail.com or a TRFSA board member. Since the time commitment for coaches and board members are greater than the 2 hour requirement, coaches and board members receive 1 free player registration per position. I'm interested in being a referee. Who should I contact? We have to have referees in order to host home games. Details about becoming a referee are posted under the on the "Referee" tab. Referees are a paid position. If you are interested in becoming a referee, please email the TRFSA president at trfsoccerpresident@gmail.com or a TRFSA board member. My player can no longer play, can I get a refund? Refunds of player fees are available. The amount of the refund will depend on the time and the league that the player is in. A player that withdraws before the first practice is eligible for a 100% refund of player fees. Once practices have started, a player that withdraws will not receive a refund unless they are injured or leave due to extenuating circumstances. A player that is injured prior to mid-season or can no longer play due to extenuating circumstances (moved, illness, etc.) is eligible for a 50% refund of fees. A player that withdraws by April 30th is eligible for a 100% refund of the fees. A player that withdraws after April 30 th but before the first game will receive a refund of 80%. Once the season has started a player that withdraws will not receive a refund unless due to injury or unforeseen circumstances. For cases of injury or unforeseen circumstances, if a player can no longer play prior to mid-season they will receive a 50% refund of fees.